I cut up a chicken into pieces. Then I season with pepper, garlic powder and anything else I have a taste for like onion powder, a dash of nutmeg etc. I don't use salt at this point because it pulls the juices out of the meat. I put them in a bag and put them in the fridge for several hours. 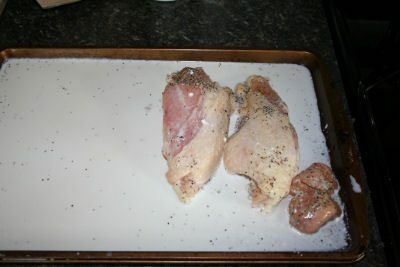 I usually prepare the chicken this way the night before or the early the morning I plan to cook it. Then I soak it in buttermilk a few hours before preparing to fry it. The lactic acid int he buttermilk helps to tenderize the meat. It also gives the seasoned flour something to hold on to. I use buttermilk that i culture myself. You can find out how here in our dairy/yogurt thread. I use flour - usually self rising and season it with similar things as the chicken - pepper, garlic powder and anything else I have a taste for like onion powder, a dash of nutmeg etc - and salt to taste. The flour coating just isn't good without some salt. While I am doing this I get my oil heatig in my pan. 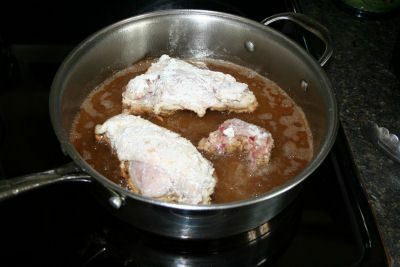 You want it to slow heat and be sizzling hot when you put in your chicken. If you get it too hot the chicken's crispy coating will burn before the meat is cooko through to the bone. In go the pieces of chicken - first soaked in butter milk then rolled in seasoned flour. 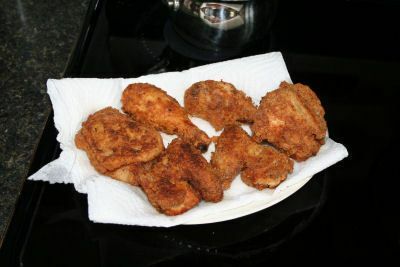 If you like a thicker crispy coating after you roll the chicken pieces in flour dip them back into the buttermilk and then roll them in your seasoned flour again before putting in the hot oil. Once the chicken has browned nicely I turn it over for the second side to brown. The secret to good juicy chicken is turning it only once. You don't want to loose the meat juices to the pan. be patient. Let it fry slow and steady and turn it only once. Once both sides are cooked nice and golden brown take them out to drain on papertoweling or a brown paper bag. The paper bag will wick away more surface oil left from frying but they are hard to come by these days in the world of plastic grocery bags. Also - lard cooks better than oil. 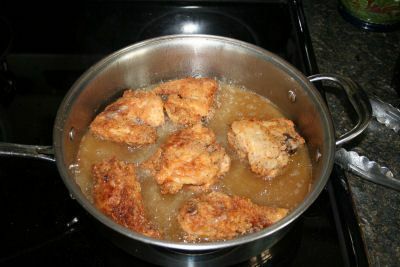 If you get your grease hot - and are careful not to let it burn - you won't get greasy chicken. You get cripy perfect chicken every time. Images copyright BigRedCouch.com. All rights reserved. This page was created in Notepad by Angie.